Smart guns got a publicity boost in January, when President Obama advocated their potential as part of his emotional speech in the wake of the San Bernardino mass shooting, and the San Francisco Smart Gun Symposium aimed to capitalize on that. The symposium, held on Tuesday, assembled some big names: San Francisco Police Chief Greg Suhr, gun violence and public health expert Stephen Teret, and Silicon Valley angel investor/lightning rod Ron Conway were all in attendance. Conway’s investments read like a who’s who of Silicon Valley, but it’s his passion for gun control (he’s on the board for Sandy Hook Promise) that brought him to the conference. Unfortunately, the event—which kicked off with a press conference followed by a luncheon—was big on names and low on results. It mostly boiled down to this: Smart guns are coming. Eventually. Probably. And no one wants to buy them. Conway introduced developers funded by his Smart Tech Challenges Foundation—a non-profit developed to promote gun safety. Of particular note was 18-year-old Kai Kloepfer, who was presented by Conway as “the Mark Zuckerburg of smart guns.” Kloepfer presumably earned the totally cool and not at all bizarre name due to his being young and tech savvy, but the fingerprint scanner he’s incorporated into a gun doesn’t really scream Facebook. Smart guns are weapons that utilize technology (like Kloepfer’s fingerprint scanner) to prevent an unauthorized user from firing them. At the press conference, “personalized guns” and “childproof guns” were also used to describe them. Smart handguns make sense in certain scenarios. If someone with small children wanted to keep a gun in his or her home, and maybe didn’t keep that gun locked up properly, and the gun got into the wrong tiny hands...it wouldn’t be able to accidentally, tragically, go off. According to a handout from Washington CeaseFire, one of the organizers of the symposium, approximately 1.7 million American children live in homes where there are unlocked, loaded guns. There’s also the issue of stolen guns being used in violent crimes, and of suicides being committed by people who’ve obtained a weapon that doesn’t belong to them. “Guns won’t go away, and we’re going to have to deal with that reality,” noted Washington CeaseFire’s Ralph Fascitelli. While Kloepfer and the other developers toil away on the technology, smart gun proponents are focusing on an issue greater than any inventor’s challenge: who is going to buy these things? The current push is to put the technology into a handgun. It makes sense because handguns are a major chunk of gun sales, but according to symposium participant Jonathan E. Mossberg, creator of the “iGun” shotgun (which he said works just fine) there’s “no market” for their smarter cousins. And Ernst Mauch, who developed the Armatix iP1, said he didn’t know how well his own product was selling. When will more smart guns actually hit the market? The research and development phase will take at least another two years, so not anytime soon. Why not pour resources into creating an accessory that could turn any gun into a smart gun? Smart Tech Challenges Foundation director, Margot Hirsch, noted that the group is facilitating research in that direction, but inventors like Mossberg maintain that if owners are modifying their own guns to make them smart, their reliability could be compromised. They also discussed Mauch’s iP1 pistol. 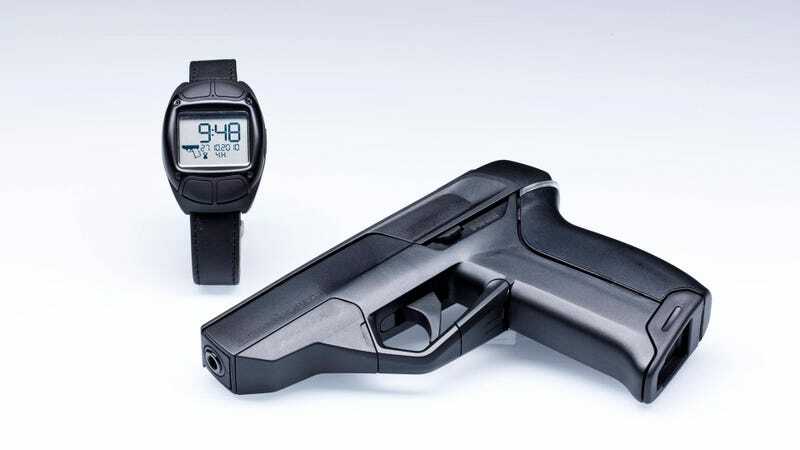 It’s one of the few smart guns currently available on the market, but it’s only active when it’s connected to the company’s “Smart System” radio-controlled watch. Once “personalized handguns are available” anywhere in the country, all handguns sold in New Jersey must be smart guns within 30 months. The law itself has been making gun control activists more than slightly nervous. Though the press conference, which was obviously extremely pro-smart guns, didn’t dig too deep into that part of the issue, it’s a big part of why gun enthusiasts, the National Rifle Association among them, are suspicious of the smart-gun cause. Smart gun proponents are focusing on an issue greater than any inventor’s challenge: who is going to buy these things? “There is no quick fix,” Smart Tech Challenges Foundation director Hirsch said, and she’s right. Even if flawless, 100 percent reliable smart-gun technology is ever achieved and is way more effective than, say, the iPhone thumb print ID—there will still be plenty of human hurdles to cross. Like who the hell will buy the damn things.